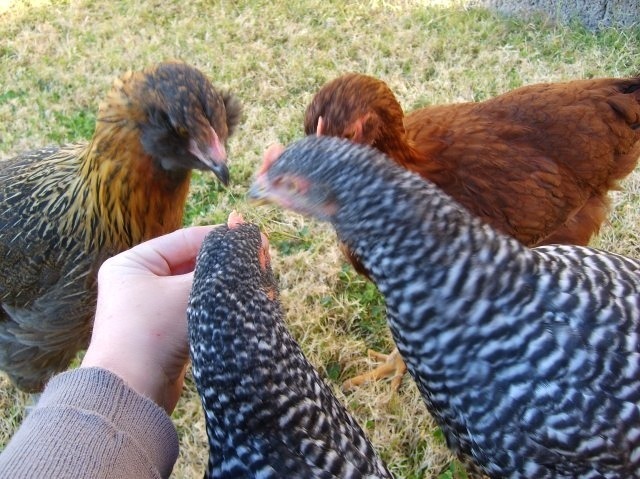 Giving goodies to your chickens is a great way to earn their trust and get them to love you! Chicken treats are also very helpful for use in training your flock to come when called. It’s quite a sight to see the procession that follows me every time I walk across my yard—even when I’m empty handed. I look like The Pied Piper of Hamelin, but with large birds marching after me instead of rats! When to Dole Out the Good Stuff and What Chicken Treats are Safe for Your Flock: It’s sometimes hard to wait, but I usually keep my baby chicks on chick starter only, and delay giving them chicken treats, until the chicks are old enough to be in an outside coop. Chick starter is formulated to be easily digested by the chicks. Once the chicks are outside, they will naturally pick up grit, in the form of sand and tiny pebbles from the ground, which aids them in digesting grass, bugs, or treats. If you choose to give chicken treats to your chicks before they are living outside, you’ll need to provide a small dish of sand or parakeet grit in their brooder for them. We eat the insides of the melons and our hens are happy to get the rest. Most of your leftovers will be safe for your flock, but try to avoid salty foods. It’s okay to give your chickens fruit that has gone a little soft, such as strawberries or tomatoes that no longer appeal to you, but if there are any signs of mold or the food is spoiled – toss and do not give to your flock. Moldy food is toxic to chickens. Occasional cookies, pasta, or breads are fine, but make sure poultry feed makes up the main part of your flocks’ diet or you may see a reduction in the number of eggs you collect. 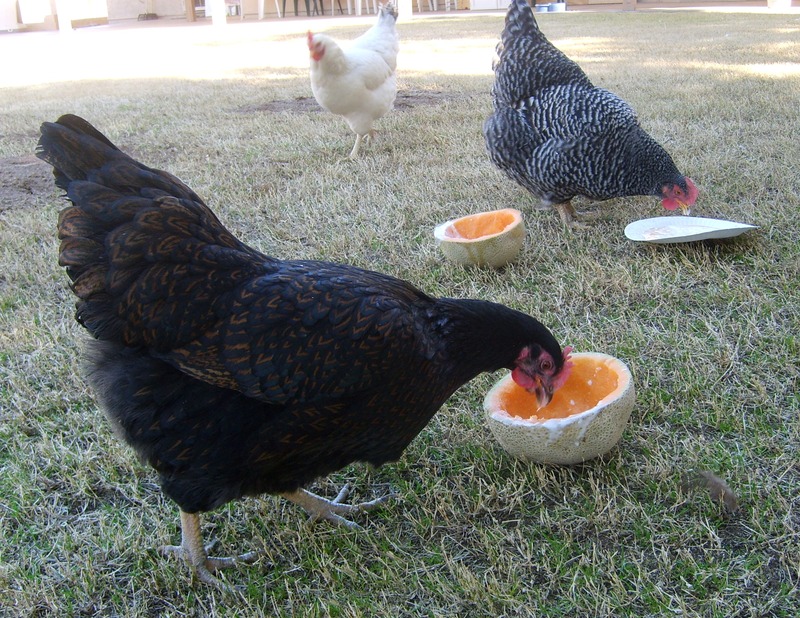 Citrus is another food that should not be given to the chickens because of the acidity, although my flock seem to have figured that out themselves. They do not touch the citrus fruit that falls from our trees. Garlic and onion won’t hurt your flock, but may give a strong taste to the eggs. According to My Pet Chicken’s free chicken care e-book, it’s also important to avoid feeding your flock avocado skins and pits, bones, raw potato skins, long cut grass (can clog their digestive system), and chocolate. 6/21 Update: My Pet Chicken is now carrying even more healthy Chicken Treats than before and I added a couple of my favorites to the list above. Be sure to also check out the high protein scratch called Chicken Crack (high protein since it contains dried mealworms and river shrimp) and the Cluck’n Sea Kelp (a very healthy suplement to add to your chicken feed). The Chicken Fun Toy is great for keeping your chickens busy and entertained while also being treated to some goodies. I love the tips. In the summer time when it gets really hot, I give my girls frozen berries floating in water. It’s fun for me to watch them bob for it and they love it and get cooled down a the same time. You didn’t mention nastursiums, self sowing, fast growing and invasive here in California. I pull up handfulls on the weekend, leaves and flowers disappear. Weedy grasses I pull up, and will now tear shorter, are also well loved. I give my peeps gut loaded mealworms for a couple days seems to work for me. I carry chicken treats in a white bucket. I had over 70 birds a while back. Thet would all follow me all over , till I turned around then they would just start milling around like nothing was going on..A soon as I started walking away the would be hot on my heels. Thanks for writing that, helps a ton. bake for 10 mins or until crispy, on 350, my chickis like them burn a little ! Hi i heard that letting your chickens eat raw eggs will make them want to crack and eat there own eggs is that true? Ashley, I think it’s best not to give your chickens raw eggs, for the exact reason you mentioned, but scrambled or boiled eggs are an excellent source of protein for your flock. You can also give your hens crushed eggshells for extra calcium – just make sure to rinse the shells well, dry them out and then crush the eggshells into small pieces.. It’s also a good idea to either bake or microwave the dried, crushed egg shells for a few minutes to kill bacteria. I was raise on a farm, and we raised chickens, and as a young boy, I enjoyed helping with that. I am retired now, and have had chickens ever sinces as a ho by, but we enjoy the eegs to eat and for cakes and pies. My chickens, 7 so far, love cat and dog food. They also eat basically everything everyone’s already mentioned, except earthworms. They hate those. Won’t even look at one. So far mine don’t like too much of anything like lettuce, cukes, tomatoes, celery. However, they like cheese a LOT! Today I gave them apple sauce which they seemed to enjoy. What a birthday surprise I received today! My little white hen laid her first egg. I really wish my silkie would have turned out to be a hen. I buy the cheapest store brand water-packed tuna and sardines for my chickens. They go CRAZY for both these. Excellent source of protein, and cheaper than cat food (which I’d read was a good source of protein, and got me thinking about it to begin with). They also are obsessed with grapes, and during our hot Texas summer I give them fresh corn and watermelon straight out of the refrigerator. My girls LOVE when I mix plain yogurt with a little milk or water, add in some whole oats, a mashed banana, raisins and viola…sit back and watch the yogurt flinging at it’s best – the girls eat the entire bowl and if they could lick it clean, they would! Mine like the discarded shrimp shells after a low country boil. They also like the soft sections of crab body shell. Could you please tell me the name of the top left chicken in the hand-feeding photo accompanying this story? I have one that looks exactly like this and I am unsure of her breed. I think she is an Ameraucana? Thanks! My kids had named the one in the photo Sparrow and she laid pretty mint colored eggs. I give mine a mash of lentils, split peas, plain yogurt, steel cut oats and corn meal. Stick everything but the yogurt in the microwave with enough water to cover for 3 min on high. I take it out, cool it down, mix in the yogurt and any frozen veggies and the love it! They LOVE hemp seeds as a treat, mix with plain yogurt. We hang a cabbage up in our pen every couple of days until it’s nice enough to let the birds out to range a little. I screw an i-bolt into the bottom of the cabbage and hang it just a little higher than they can easily reach. They get a treat and a little extra activity. A large cabbage is usually gone by nightfall – even on short winter days. I have some raw fish frozen in our freezer. Is it safe to thaw and feed my chickens the fish raw or should I cook it first? If you would eat it raw–in other words, if it’s sushi quality fish (is there such a thing as frozen sushi quality fish? )–you can share it with them. But don’t use your chickens as a way to get rid of food that is questionable or bad. If it would risk making you sick to eat it, it’d risk making them sick, too. We feed our chickens on our worm farm Superworms, they are big and like to run. The chickens LOVE to chase them and slurp them up! Is high-protein cat food good for chickens? I mix Taste of the Wild cat food at a 1:5 ratio w/ layer feed. They also get 1:5 ratio of Calf Manna to layer feed. They also run around our fenced backyard, get scraps, suet, sunflower and other types of seeds. I get comments from other chicken keepers about my chickens’ healthy plumage. Kristen, we don’t recommend feeding your chickens cat food, or cattle feed. It is not nutritionally balanced for them, and can lead to deficiencies and/or toxic amounts of some nutrients. A handful as a treat every now and then will probably not hurt, however, there are much better ways to add protein to your birds’ diet. For instance, just switch to a higher protein feed brand. Consult with your vet; he or she might agree that supplementing with game bird feed (generally higher protein) will work. Mealworms are also a great protein source (and you can get the dried mealworms if you don’t like having the live mealworms around). Don’t regularly feed your chickens something that is not designed for them as a part of their regular diet, though. Even very similar animals often have vastly differing nutritional needs. For instance, sheep can get toxic amounts of copper from goat feed. Your best bet will be to stick with the chicken feed and consult with your vet about whether your birds need more protein, and how best to provide that for them. They love maggots, which are also very nutritious! Great site and fabulous ideas for feeding chickens. It has been really cold here in NY and I am considering giving “Tillie” and the girls a warm treat of cooked veggies; broccoli and carrots. Has anyone done this? I am inspired to feed them fresh foods thru the winter. I think cooked veggies, such as broccoli and carrots would be a welcome and nutritious treat for your chickens! Is it okay to give my chickens raisins? Yes, chickens love raisins and grapes! Do you think store-bought grit is necessary for chickens that get to run around the yard most days? What about in winter? Is there a way to tell if chickens are getting too much or too little grit or small stones? Finally, can I add some dried herbs, like dill, for baby chicks just on starter? Countryside Organics seems to think it’s fine. Grit is probably not necessary for chickens who free range–most will find small stones on their own–but it’s inexpensive and doesn’t go bad, so why not provide it just to be safe? You can certainly offer plant material to baby chicks; just make sure they have access to chick-sized grit if they’re getting anything other than starter. Parakeet gravel usually works well for baby chicks. Is it good to give juice of ginger or garlic to chicken? is ginger gives health benefit and raise immune towards disease in Chicken? Ginger is thought to be anti-inflammatory…. but garlic is probably not a good idea for chickens. It won’t hurt them, but if they eat strong aromatics like onions or garlic, their eggs can come out tasting of onions or garlic, too. If you’re making quiches or onion omelettes, this might be okay with you… but you definitely don’t want it in your eggnog or angel food cake! Liver should be fine to feed your chickens. I would cook the liver, since it will be much easier for them to eat. We are considering planting wild river oats around the outside of our chicken and duck coop because this area is shaded and we are told the river oats are good ground cover and will grow in shaded areas. The birds will also be grazing in this area (as well as other parts of our yard). Are wild river oats okay for the chickens and ducks to eat? If you’re talking about Chasmanthium latifolium or Uniola latifolia, yes they can be grazed by livestock. Pretty species, too! If you do want it to survive foraging, though, be sure to keep the birds out of the seed bed until you have a nice carpet established. Otherwise they will love to eat all those oat/grass seeds you scatter! Is it ok to give chunks of plantains to chickens? Yes, plantains or bananas should be fine. Give all fruits in moderation – fruit is healthy for chickens, but is low in protein and calcium. Hi, I grow onions and wonder what will happen they eat some of them? The onions won’t hurt your chickens, but I’m guessing your chickens may not be interested in eating the onions either. My own flock ignores the citrus that falls on the ground and also ignores some of the herbs I grow, such as Rosemary, even though it is perfectly edible – it’s just not to their liking. Your chickens will love craisins and even though craisins contain added sugar, they shouldn’t be harmful to your chickens if fed in moderation, such as a special treat or dessert. I give my girls crushed up oyster shells, I was told it is good calcium and helps will shell strength. I am currently giving them frozen berries on hot days (I’m in Australia, so it is summer now) and they love them, helps keep them cool. Mine are definately tame, I basically raised them from day 1, we had them as eggs in June 2016 and I kept 4 of the 18. So they have from the beginning been used to me holding them, eating out of my hand and following me around. They come running when I open the back door, and one jumps up an pulls on my shirt when I go out with food. Today I was crouched down filling up one of their outside water bowls under a tree, and she jumped onto my back and refused to get off. Pecking at my hair and neck even just preening herself. Hi, Debra! 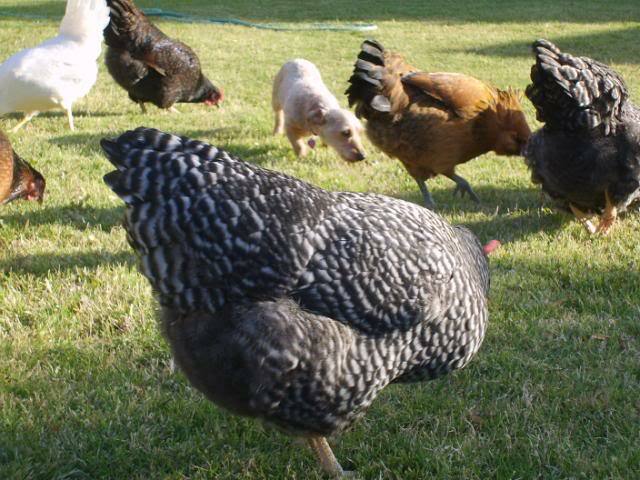 I talk about how to train your dog here in this blog post, “Training your dog to accept your chickens.” As it turned out, my little dog is off-leash all the time, and just isn’t interested in adult chickens. I’m very lucky with his personality! It can certainly depend on the breed, too. Reggie is a Cavalier Spaniel, and that breed doesn’t have a super strong prey drive in general. I enjoy reading comments. My husband & I just started last year with our backyard chickens. My grandson’s 3rd grade class (with 4 H) hatched eggs in class & students could have a chick if they so desired. We took the baby chick & were instantly hooked & rushed to get 6 straight run barred rocks. We ended up with 3 hens & 3 roosters. I loved hearing them crow!!! Until my husband pointed out that roosters don’t lay eggs. I loved them- it was heartbreaking to see them go. (They were so beautiful-prettier than the hens) Anyway, now we have 4 lovely hens & enjoy their eggs. We share them with our neighbors & family.